Update: Hugo Chavez Militarily Confiscating Farms of Venezuelan Patriots? Using Foreign Forces? You are here: Home / *Gulag Tales & Rumor Trails* / Update: Hugo Chavez Militarily Confiscating Farms of Venezuelan Patriots? Using Foreign Forces? See these Gulag entries, by Swedish Citizen journalist, Ulf Erlingsson. 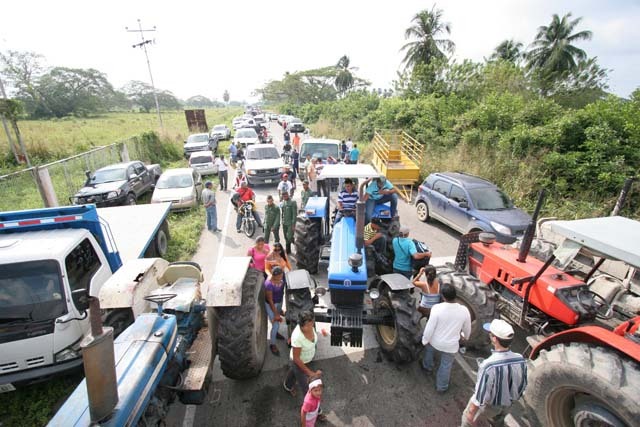 Late Sunday night, we began to see sketchy reports from individuals that farmers in the region of Sur del Lago, Venezuela were being attacked by Venezuelan as well as foreign military, all directed by Hugo Chavez. Initial and unconfirmed reports allege that fellow perpetrators are Cubans, thugs from the drug cartel FARC, and even Hezbollah, all there for the action. Twitter tweets which have been reporting these events have used hashtags: #SOSinternetVE, #SurdelLago, and #Venezuela. eralmoncada December 20th, and the majority of #Venezuela is in PROTEST and RIOTS!!! People’s sick of Chávez and his government! We want freedom! Another said that the media in Venezuela has been completely closed and that Twitter is the only way they can get the word out. Further coverage is being monitored at http://www.ruedalo.org. For background on the gradual communist revolution of Venezuela, the one the Marxstream media in America does not present, we suggest a recent report by an American communist organizer raised by Bill Ayers and Bernadine Dohrn: Chesa Boudin. Here, in March of this year, he reported about the “Bolivarism” revolution taking place there, led by friend and comrade of Ayers and Boudin, Hugo Chavez: http://www.archive.org/details/Venezuela_March07_Boudin. It should be noted that Chesa Bodin is a child of Ayers’ fellow Weathermen, criminals David Gilbert and Kathy Boudin, also grand nephew of communist organizer in America of a century ago, Louis B. Boudianoff (Boudin). After Chesa left the Ayers/Dohrn household for Oxford on a Rhodes Scholarship (he was also one of the very first class of Goldman Sach’s Global Scholars) he became an intern working for Hugo Chavez. We hope to provide further information soon.